Anchor: What do you make of this? @Komptrolla: It's sad, demeaning, embarrassing, everything bad in the books can't explain how bad this ugly development is. This isn't a way to stand your ground, respect is earned by admiration or fear, sadly Oliseh has opted for the latter means which will haunt him if he doesn't retrace his steps. @zikson_b: Every manager has his choice of choosing his captain but Oliseh didn't handle this very well. @SegunAke: Sunday Oliseh seems to forget man management is also part of his job abi he is thinking managing a National team is all about formation and tactics? Time will tell. Anchor: Is Ahmed Musa a wrong choice? With Mikel in the mix. @Komptrolla: It's never about the replacement for now, on what ground is the new captain coming in? What is the offense of Enyeama? He reported late to Belgium, does Oliseh not know about Enyeama's bereavement? It's a wrong move in the wrong direction come on! @SegunAke: I don't see Ahmed Musa as a leader judging from my living room though... Anyway, it is not about the choice now but the Enyeama situation is a total mess that needs to be fixed. Anchor: what does this development spell for the team? @Komptrolla: Doom! Division and contempts. There will never be unity in the team with this kind of development, some players that think Enyeama has been unjustly treated will certainly form a clique, those loyal to the coach for shirt reasons will be on the other side, we've been on this road before notably during the days of Oliseh, it didn't help us in the past it won't help us now. @zikson_b‎: This is definitely not the end of this issue. Oliseh himself had issues when he was the captain of this team. If he doesn't get result soon enough, he will face lot of criticism. Enyeama has retired from international football but some players will not be happy with what haappend considering Enyeama's influence in the team and this will cause some kind of division. Anchor: Talking about Ahmed Musa, what will he bring to the squad? @Komptrolla: A Latin quote says "Nemo dat quod non abet" you can't give what you don't have. Musa has never looked like a leader, he'll bring his erratic runs and wayward crosses to the team, no prejudice intended but it's a wrong choice just like the actions of his coach. @zikson_b: I stand to be corrected but I believe Musa has little or nothing to give in terms of carriage or contributions as the skipper. He's arguably the best Nigerian player in Europe at the moment but I really don't see much coming from him to be honest. Anchor: Is Oliseh afraid of Enyeama's team power? @Komptrolla: Obviously! He looks it. If he couldn't understand the situation of a national hero who just lost his mother then he certainly is afraid of something, but he's sadly mistaken, he should get Enyeama on his side so he can automatically get Enyeama's players subsequently. @zikson_b‎: I think Oliseh wants to be the man in charge which is not wrong but there are better ways in doing such. @SegunAke: I won't say he is afraid, like Zikon said he wants to be the man in charge but I think it is too early to impose himself that way. He could have tried to talk to Vincent Enyeama one on one rather that the public display and see if he will play by his rules subsequently before this approach. Anchor: What do you think the NFF is thinking on this? @Komptrolla: The NFF don't like Enyeama it's obvious, what if they're the ones using Oliseh to frustrate the player out? Think about it. @zikson_b‎: There are so many in-house issues that we can't see from here. It's difficult to gauge the reaction of the NFF. @SegunAke: NFF have moved on from it already, a sane organization should release a statement so as to calm the boat but we all know how NFF could be when it comes to damage control. Anchor: Ok. What's the way out of this? @Komptrolla: Simple. Halt the rot. 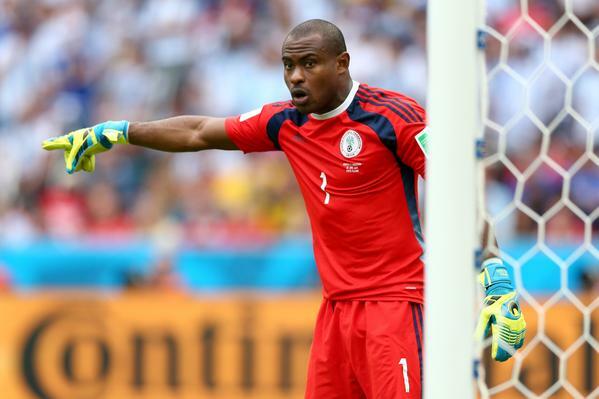 Settle it and restore Enyeama as skipper and move on together. @zikson_b‎: Nothing will change again. Oliseh will just have to improve on his man management skills and understand he will need to be more patient in handling the egos of the players to avoid a recurrence. @SegunAke: A press release by either Oliseh or the NFF is important, Sunday Oliseh should learn from this and improve on his man management skills like Zikson pointed out. Everyone should move. Life goes on! Anchor: Where does this leave Musa? @Komptrolla: Should he have collected the arm band in the first place under such circumstance? No! Remember in 2002, Onigbinde handed Kanu the arm band but the latter realized it was meant for Okocha and he turned it down, Musa should read that chapter of our football history and wait for his time. @SegunAke: Awkward I suppose. Komptrolla is spot on this, Enyeama was his captain and it is only proper to reject the armband as a sign of respect. Anchor: What are your hopes for the coming games against Congo and Cameroon? @Komptrolla: It's hopeless when you field a team with division. @zikson_b: I hope it can help in our rebuilding process. @SegunAke: This is the first time under coach Sunday Oliseh the new players like Balogun and co will be playing with some of the victorious 2013 team, so it is a step in the right direction. We have to keep in mind that this is a team in transition, no magic! Anchor: That's where we draw the curtain today, you can join the discussion by leaving your comments below. See you next time for another sizzling topic.